Detail of installing first of 20 squares for the Guns into Flowers handmade paper quilt with seeds for wildflowers in the pulp. 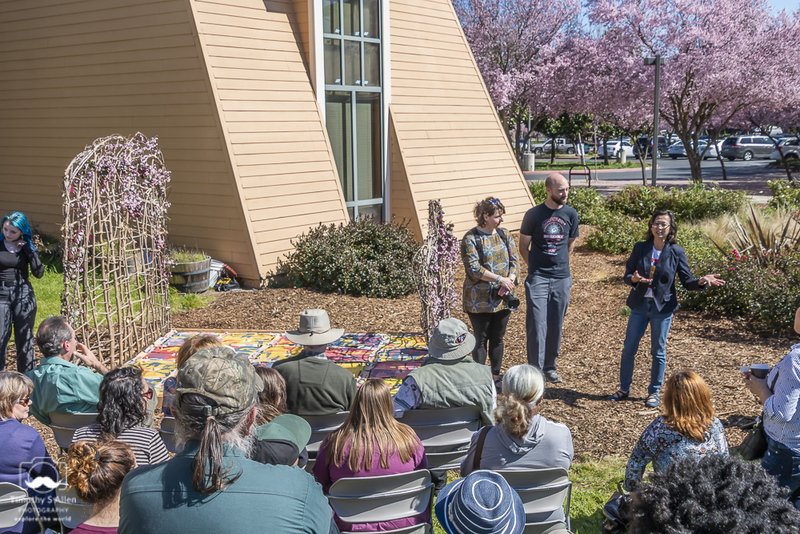 These photos are of the installation ceremony on Saturday, March 16, 2019 at South Natomas Community Center Park, Sacramento, CA. Many people came out to see the installation and support this project that focused on raising awareness about the issue of gun violence. The Guns into Flowers “quilt” will dissolve into compost over time and the wildflower seeds in the handmade paper pulp will sprout and grow into a living blooming bed of wildflowers in the same colors and pattern, thus transforming the “guns into flowers”. Laying down the Guns into Flowers Quilt on the prepared “bed”. Natomas Charter School visual arts students laying down the quilt squares and staking them to the ground with bamboo skewers having a wine cork on top. Detail showing two students installing a Guns into Flowers handmade paper quilt square. Natomas Charter School visual arts students, principal and art teachers with the artist Jane Ingram Allen after the installation is completed. Students and teachers spoke at the installation ceremony to tell about their experience of working on the Guns into Flowers art project. The installation of the “Guns into Flowers” handmade paper quilt with seeds for wildflowers in the paper pulp was done with the participation of the visual arts students of Natomas Charter School. 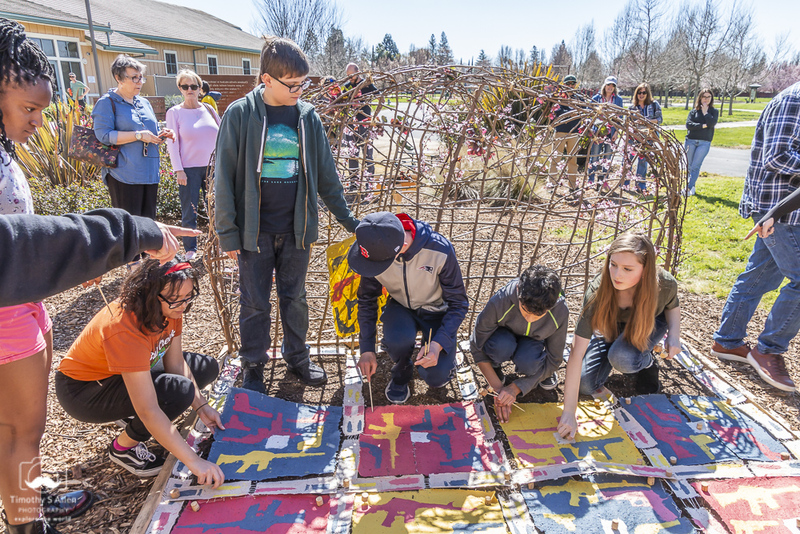 The students were involved in the whole process of creating a public art installation in a city park at the South Natomas Community Center. 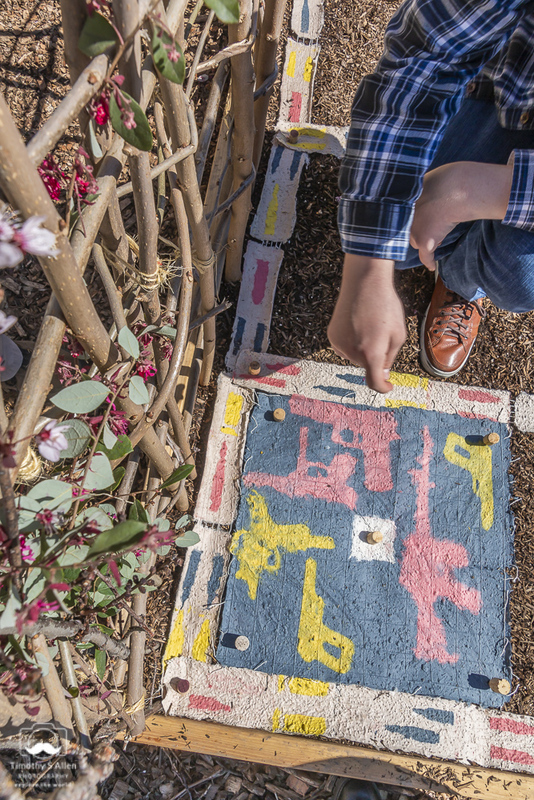 The Guns into Flowers art project was created during a three-week artist in residency at Natomas Charter School working with the students to make the handmade paper quilt and create a “flower bed” with a headboard and footboard woven of local branches. 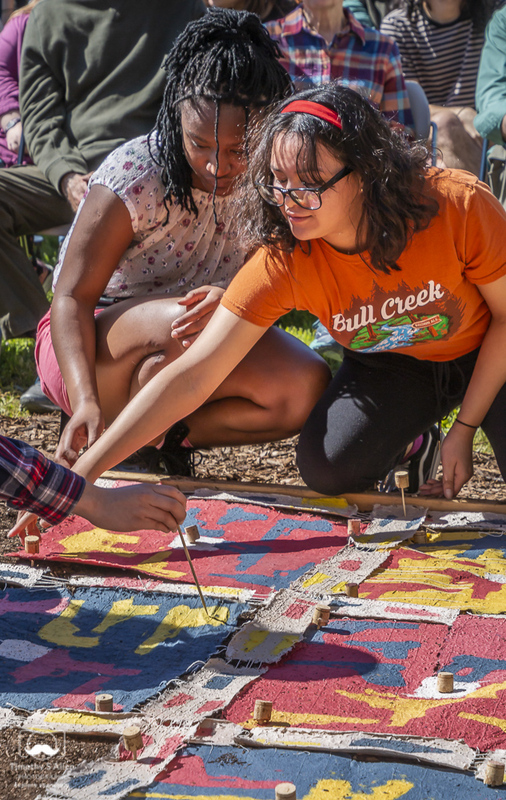 The quilt was installed in a public ceremony with students laying down the 20 squares and borders to form the quilt on the 8 feet x 10 feet “bed”. Thanks to all the students and teachers at Natomas Charter School Performing and Fine Arts Academy for their participation in this project and to our other sponsors: Natomas Arts & Education Foundation, N Magazine, City of Sacramento, Edward L. Anderson Jr. Foundation and The Arts Engagement Foundation of Kansas City. It was a great experience working on this project with the students to create a public art installation in Sacramento. Photos of the installation are by Timothy S. Allen (allentimphotos2.wordpress.com). 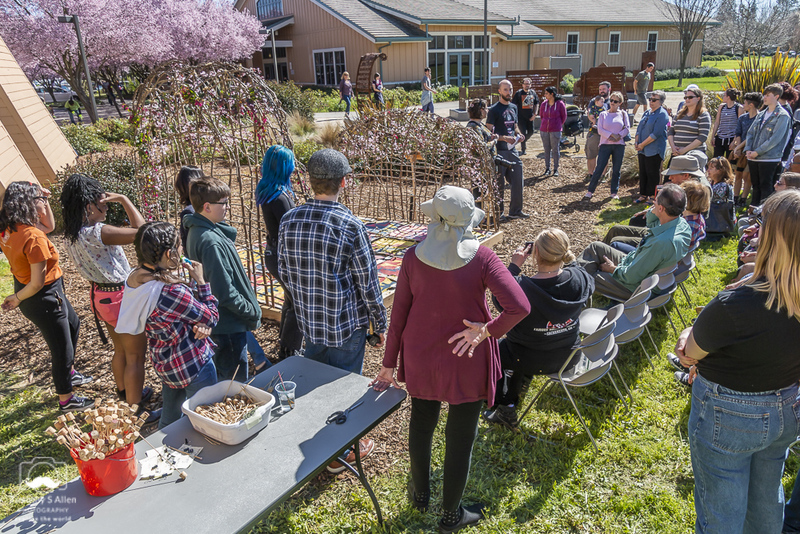 The public is invited to see the installation of a handmade paper quilt with seeds for wildflowers in the pulp placed on an artist-created “flower bed” at South Natomas Community Center, Sacramento, CA. 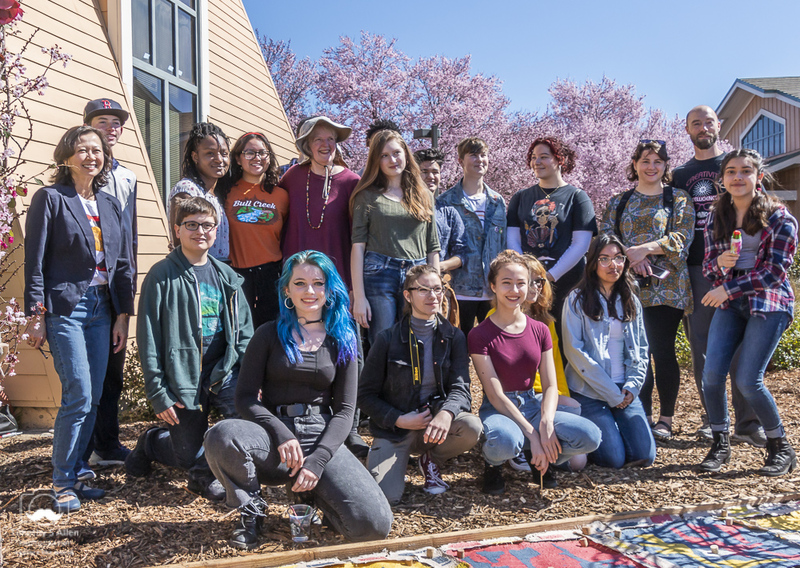 Visual Arts students from Natomas Charter School and the artist Jane Ingram Allen will be there to speak about the project after the installation of the handmade paper quilt, starting at 2PM on Saturday, March 16. The “Guns into Flowers” public art installation will begin at 2PM on Saturday, March 16, 2019 at South Natomas Community Center Park, 2921 Truxel Road, Sacramento, California. 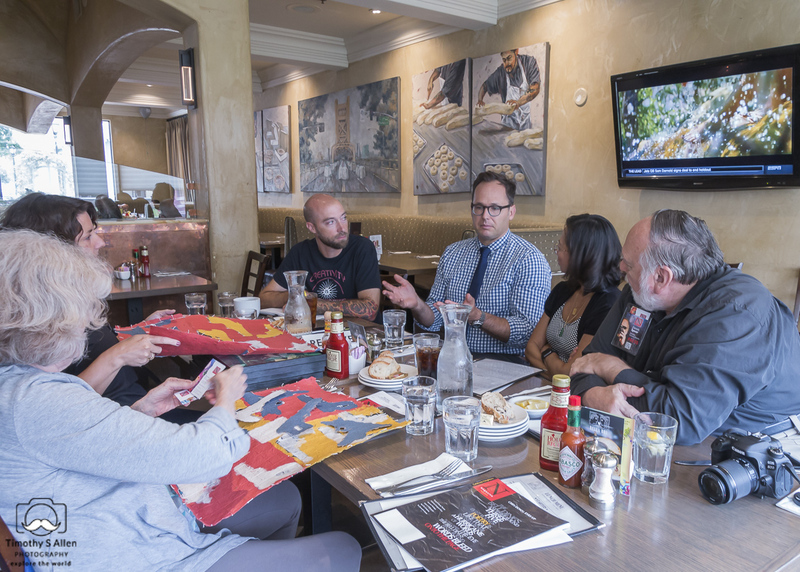 Sponsors for this art project include Natomas Arts and Education Foundation, N Magazine, City of Sacramento, Natomas Charter School, Natomas Charter School PFAF, Edward L. Anderson Jr. Foundation, and the Arts Engagement Foundation of Kansas City. This art project has been created by artist Jane Ingram Allen and students at Natomas Charter School, Performing and Fine Arts Academy, during a three-week artist in residency from Feb. 25 to March 16, 2019. Read more about this art project and see photos from earlier posts on this blog. Photos are by Timothy S. Allen. Check back to see how the handmade paper quilt with seeds in the pulp changes over time into living blooming wildflowers. It is hoped that this project will raise awareness about gun violence and create more public dialogue about possibilities for change. I started working as a visiting artist in residence on Monday, Feb. 25, at Natomas Charter School in Sacramento, CA. I am creating an outdoor public art installation titled “Guns into Flowers” with the students to raise awareness about gun violence in our schools and communities. We are making a handmade paper quilt with a gun motif and seeds for wildflowers in the pulp to transform the guns into flowers over time as the paper pulp dissolves into compost, and the seeds begin to sprout and grow into blooming flowers. 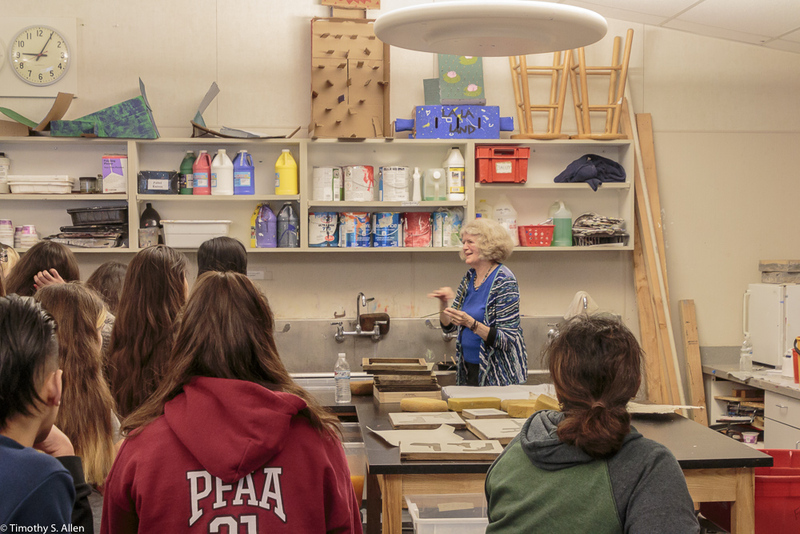 Here is a photo of some of the students learning about papermaking and getting introduced to the project at Natomas Charter School Academy of Performing and Fine Arts. Photos to document the project are by Timothy S. Allen. Keep watching this Blog to see more photos and follow the progress as we continue with papermaking workshops this week and next to make the quilt squares. The official opening ceremony and laying down of the “quilt” will be on Saturday, March 16 at 2PM in the park at South Natomas Community Center, Sacramento, CA. 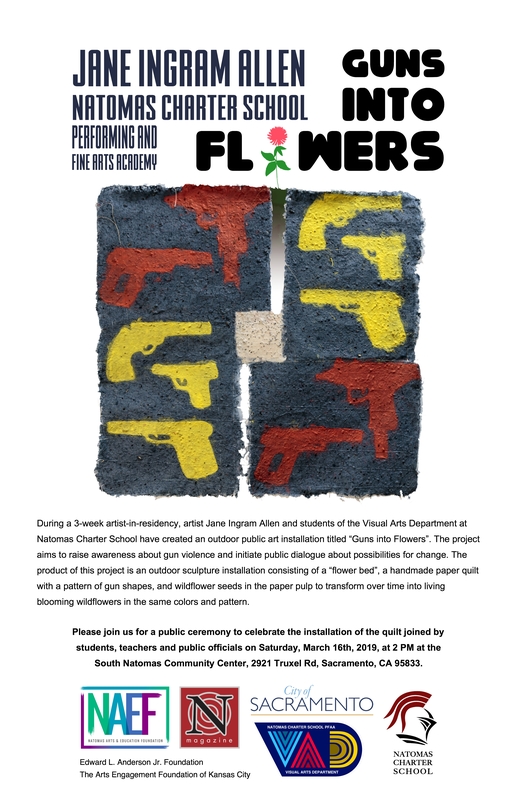 During a 3-week artist-in-residency (February 25 – March 16, 2019) in Sacramento, CA at Natomas Charter School (http://www.natomascharter.org,) artist Jane Ingram Allen will create an outdoor public art installation titled “Guns into Flowers”. The art project aims to raise awareness about gun violence and initiate public dialogue about possibilities for change. The art project will result in the creation of an outdoor sculpture installation consisting of a “flower bed” and a handmade paper quilt with a pattern of gun shapes and having seeds for wildflowers in the paper pulp to transform over time into living blooming wildflowers in the same colors and pattern. 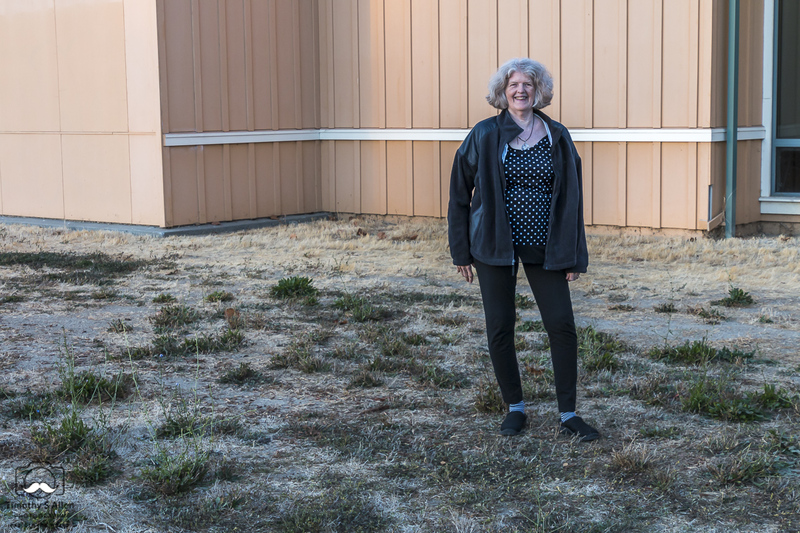 Jane standing at site for “Guns into Flowers” installation at South Natomas Community Center, Sacramento, CA. 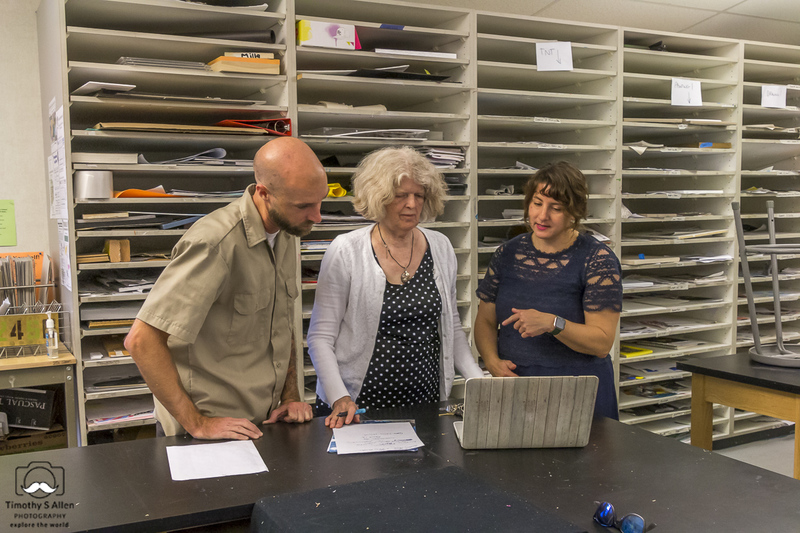 Jim Vetter, Chelsea Greninger and Jane Ingram Allen at South Natomas Community Center, Sacramento, choosing site for “Guns into Flowers” installation. Jane and Chelsea Greninger, Natomas Charter School Visual Arts teacher hold a prototype for a quilt square for the Guns into Flowers art project. Natomas Charter School Principal Dr. Ting Sun and visual arts teacher Jim Vetter and Donald Gensler with Sacramento Metropolitan Arts Commission look on. 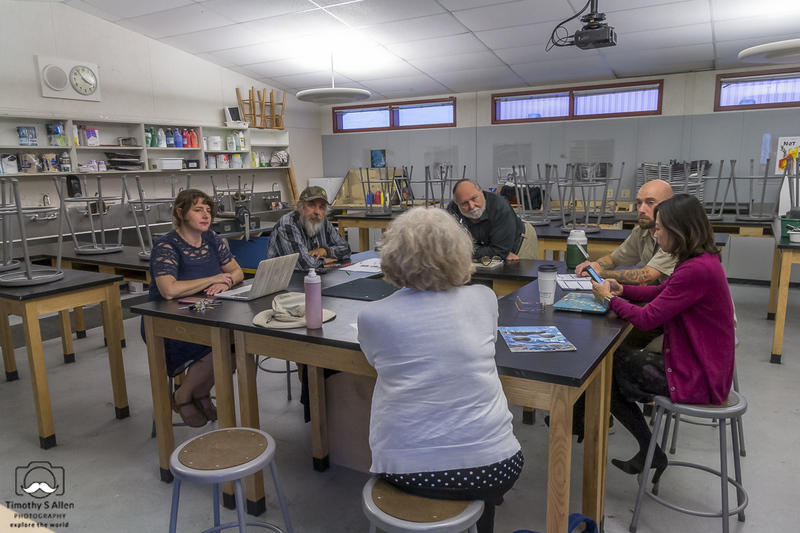 Jane meets at Natomas Charter School in the visual arts studio room to plan the “Guns into Flowers” art project in Sacramento. 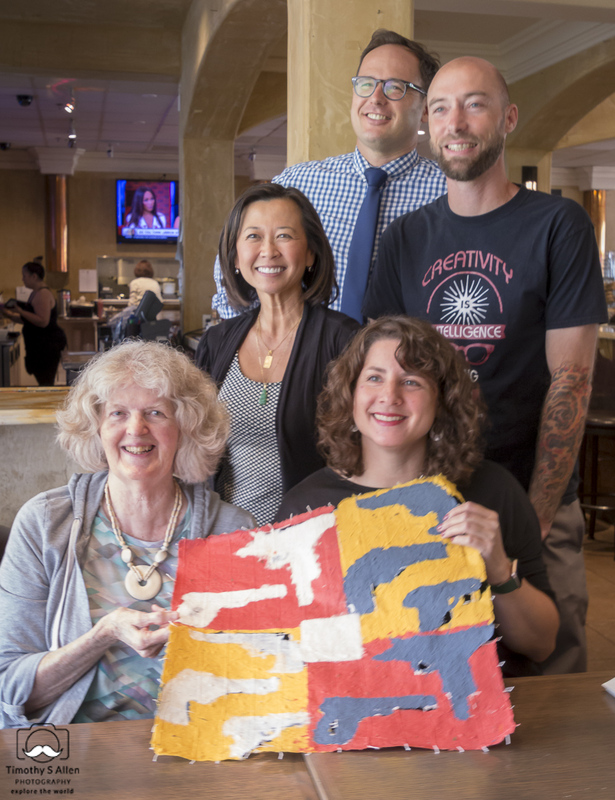 The handmade paper quilt will be created by student participants working with the artist in “open studio” papermaking workshops at the Natomas Charter School, Performing and Fine Arts Academy (grades 6-12). The quilt blocks will be created with stencils in the handmade paper sheet-forming process and individualized by each participant. 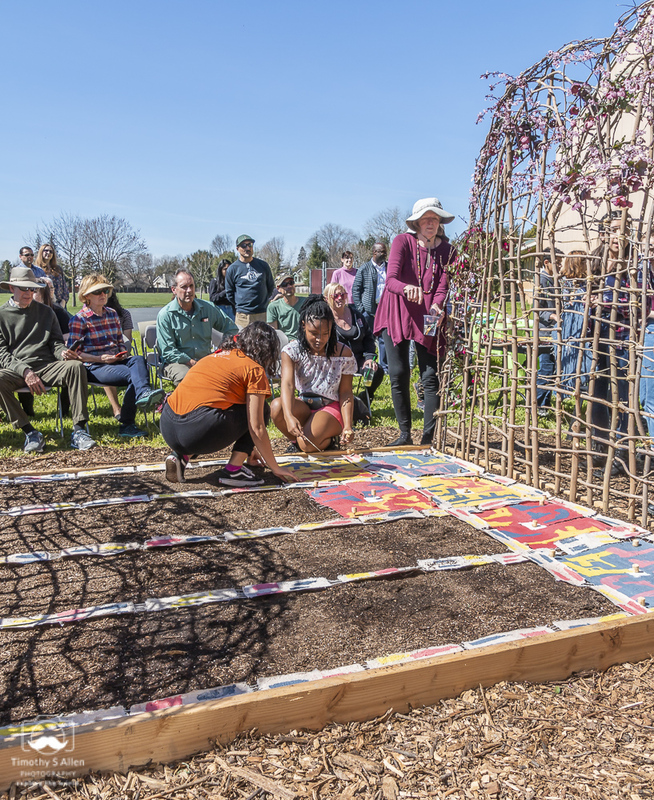 The “Guns into Flowers” handmade paper quilt will be installed on a raised “flower bed” about 8 feet x 10 feet x 8 inches high with a headboard and footboard woven by the artist and participants using local trimmed tree branches. The handmade paper quilt will gradually dissolve into mulch over several weeks or months as the wildflower seeds in the pulp begin to sprout and grow, transforming the ”guns” into flowers. The public art installation will be created in a public park at South Natomas Community Center and coordinated with city and park representatives. 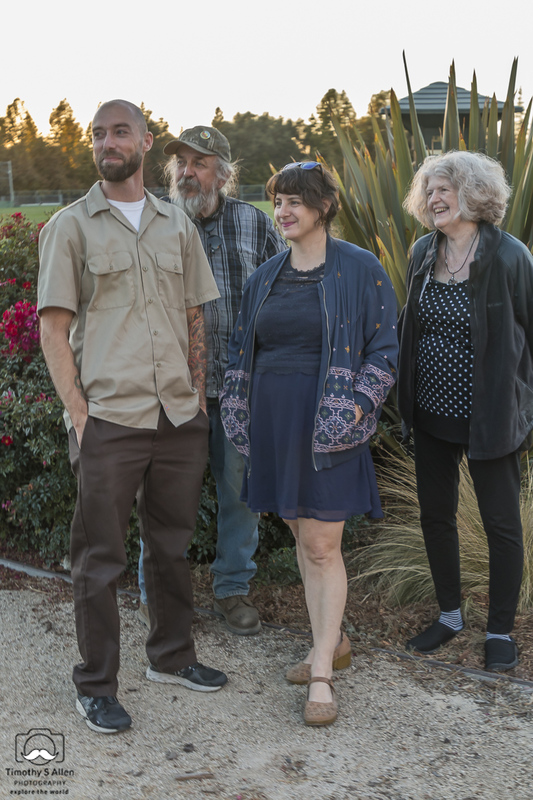 The public opening and installation ceremony for the “Guns into Flowers” project will be at 2PM, Saturday, March 16, 2019 at the site, South Natomas Community Center, 2921 Truxel Road. Sacramento, CA. “Guns into Flowers” will transform over time following the natural cycle of life and emphasize working together for social and environmental change.